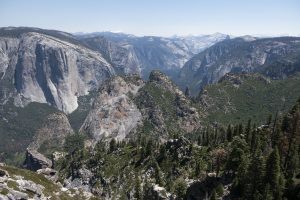 You’ll pass a lovely meadow on the way to an amazing vantage that offers sweeping views of Yosemite Valley and the famous cliffs of El Capitan. The trail drops through a nice forest on the way to flower-filled McGurk Meadows and the historic cabin. Past the meadows, the trail travels through more forest to reach the Pohono Trail. Head west (left) at the junction. The trail travels over numerous ridges through the varying forest and crosses seasonal streams before climbing up on the ridge that leads to the point. While views have been scarce up to this point, the trees begin to thin and views of the mountains of the Clark Range emerge. The trail heads out to a rock outcropping looking thousands of feet down sheer faces to the valley below. In the spring, Ribbon Fall wisps down the cliffs next to the massive, famous cliff of El Capitan to the east. Cathedral Rocks and Leaning Tower are immediately below you. While Bridalveil Fall is also right below you, it’s obscured. You’ll need to continue further on the trail to Crocker Point and Stanford Point to see it (see Stanford Point).